The global 3D imaging market is foreseen in a report by Transparency Market Research (TMR) to bear a vendor landscape that carries a vastly intense level of competition between individual players. According to seasoned TMR analysts, the market could be highly consolidated due to the presence of fewer popular and firmly established companies. Most players are anticipated to adopt three key business strategies to cement their position in the market, i.e. expanding product portfolio, facilitating product differentiation, and participating in mergers and acquisitions. The competition could level up with the entry of new players in the global 3D imaging market. Philips Healthcare, Hewlett-Packard Corporation, and Lockheed Martin Corporation are some of the top players operating in the market. 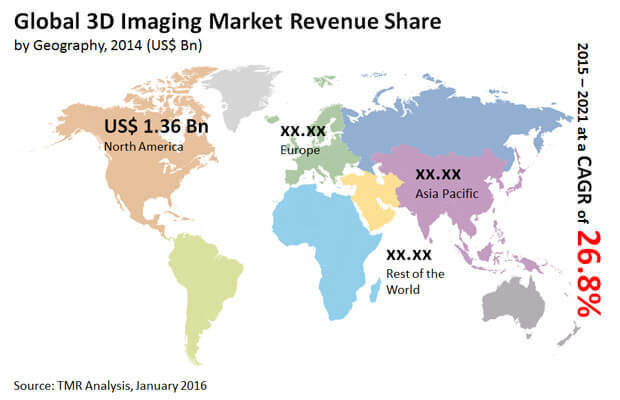 As per TMR, the global 3D imaging market could be valued at a US$17.99 bn by the completion of 2021. On the basis of end-use industry, the market is predicted to find healthcare securing a lion’s share in the coming years. With respect to region, North America could reach to a stronger market value by the end of the forecast period 2015-2021. The world 3D imaging market is foretold to attain massive growth on the back of widespread use of the technology in the automotive and healthcare industries. 3D imaging is extensively used in provision of treatment, diagnosis of diseases, research, surgery, and other individual domains in the healthcare industry. Demand for efficient technologies such as 3D imaging in healthcare is stoked by increasing incidence of heart disease and cancer and rising frequency of complex surgeries. Even in the field of medicine, 3D imaging is considered to be a highly useful technology. 3D imaging also finds application in other industries for designing a range of technologies including drones, robots, automobiles, and gadgets. Thus, any growth in these industries could mean a positive sign for the world 3D imaging market. The international 3D imaging market is expected to showcase a great potential for expansion in the near term. However, limited funding available to small businesses and expensive initial cost of setting up 3D imaging equipment could raise fears of reduced growth in the market. Moreover, low awareness about the use of the technology and lack of skilled professionals are envisaged to hamper the demand in the market. Nonetheless, players could bank on opportunities created with the introduction of innovative and cost-effective variations of 3D imaging in the global market.